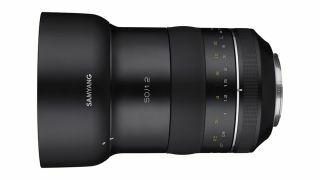 South Korean lens manufacturer Samyang has confirmed that a new XP 50mm F1.2 is set to be made available for Canon full-frame DSLR owners. The lens is said to be optically good enough to work with cameras whose sensors exceed 50MP, although Samyang also cites 8K video as a suitable application. It features 11 elements spread across 8 groups, and has aspherical and high-refractive glass among these to control aberrations, in addition to multi-coatings. It also features nine aperture blades for round bokeh, although the absence of an autofocus motor means that focusing has to be performed manually at all times. The lens is the third XP optic to date from the company, following the XP 14mm F2.4 and XP 85mm F1.2. According to Samyang, 'XP' stands for Excellence in Performance, although the f/1.2 aperture makes it fairly clear that the lens is designed for a more demanding audience. Even so, the optic arrives with a very reasonable £799 asking price in the UK. Compare that with the average £1,200 price tag of Canon's own (admittedly autofocus-enabled) EF 50mm f/1.2L USM and you can see just how aggressively the XP 50mm F1.2 is priced. The lens is set to arrive in March and its first public showing will be at The Photography Show in Birmingham. We'll update this page with pricing for other territories once we have it.